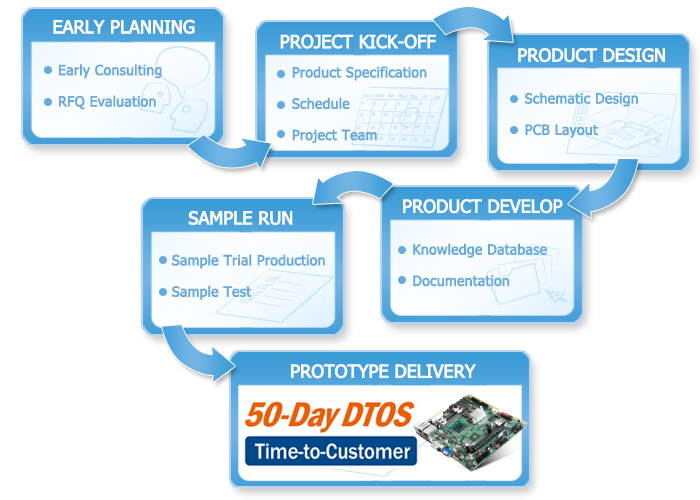 Advantech Design To Order Services (DTOS) is a design service which provides tailor-made systems or boards to meet specific application requirements through advanced, innovative and world leading technologies, diverse levels of customization, flexibility of manufacture, and global technical & logistical support. Advantech DTOS offers you the advantages of faster project development, lower risk and the assurance of working with a trusted global leader for win-win solutions. With strict project workflow, integrated infrastructure, and highly proficient project development, we promise our customers a quality and speedy 50-Day Design To Order Services.